If you’ve ever dealt with tarnished chrome, you know it’s ugly and hard to polish. Killer Chrome™ Perfect Polish makes it easy. As the most advanced metal polish money can buy, it creates a mirror finish on chrome, aluminium, stainless and even brass. This stuff is Enthusiast Grade® and can do it all. Its non-abrasive chemical formula means you can use it repeatedly to remove surface rust and oxidation with no fear of damage to your chrome or metal, unlike abrasive metal cleaners that can lead to expensive re-plating. It also works twice as fast as other polishes whether you apply it by hand or machine. 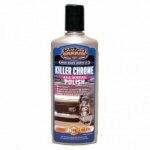 Safely get rid of tarnish and get a killer mirror finish with Killer Chrome. You can use Killer Chrome on any type of metal – stainless steel, polished aluminum, brass, copper and, of course, chrome. Unlike other metal polishes, Killer Chrome is completely safe because it uses chemical abrasives instead of harsh physical abrasives that damage and scratch the metal. Introducing the new Tyre & Wheel Kit. The perfect package for bringing your wheels back to life! Save Over £7.00 when you buy all three products together. Tyre and wheels are constantly exposed to brake dust, dirt, and grease. That’s why you need our Enthusiast Grade® products to keep those tyres and wheels looking like they just came off the showroom floor. What goes best with clean shiny wheels? Tyres that look brand new. Nothing else helps your ride look its best more than clean wheels and tyres, so use Beyond Black tyre dressing. It’s got a no sling, no gel formula. No thick, glossy look here. Beyond Black puts that straight-off-the-showroom-floor shine on your tyres. It even helps extend their life and protect them from UV rays. What could be better? Oh yeah – it lasts for weeks. Get Beyond Black and get the look of brand new tyres. 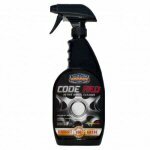 Code Red – no more mercy, no more brake dust™! Just to be clear – this is not your dad’s wheel cleaner, so get ready to spray on and stand back! If you’ve picked up this product, you’re tired of the same old, wimpy wheel cleaner that’s weak, dull & short-lived. Are we right? Then we dare you to call in a Code Red! 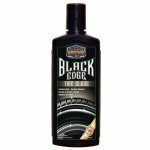 Your wheels take a beating from the road and Code Red Wheel Cleaner is just what you’ve been waiting for! It’s acid-free formula actively hunts down brake dust & other contaminants, making it the most effective product for cleaner, brighter wheels. Watch as it’s Advanced Reaction Technology™ moves in on the grime, turning from green to red as it’s working. What’s more embarrassing than dirty brown tyres or brake dust on your wheels? I can’t think of anything. 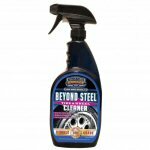 Get rid of it quick and easy with Beyond Steel Tire & Wheel Cleaner. It’s fast, easy to use and will get your wheels and tires looking brand new in seconds. If you’ve got thick road grime, use a light brush and it’ll disappear before you can check your watch. Everyone knows tyres aren’t brown. Clean them with the most powerful tyre & wheel cleaner on the market. The best part is you can safely use Beyond Steel on any wheel, even those with clear coats. So now you have no excuse for dirty wheels and tyres. Here’s what to do after you clean your tyres and wheels with Beyond Steel. First, give your tyres that factory-new look with Beyond Black Tire Pro, the No Gloss Tyre Dressing That Shines. Then, give your wheels that same great factory-new look with one of our Perfect Polishes (Killer Chrome, Maximum Metal, Absolutely Aluminum). Like all Black Edge™ detailing products, this Tire Gloss lives up to its name. No other product anywhere is easier to apply or delivers such a stunning, high gloss, Jet Black shine. Never, ever leaves a greasy, slimy mess or gel to clean up. Jet Black gloss and repels dust and dirt to keep your tires looking that way for weeks.